Apple tried to be smart with OS X Mavericks, developing their own FTDI drivers. Just too bad they don’t seem to work. I have been getting nothing but “avrdude: stk500_recv(): programmer is not responding” errors when trying to upload sketches to various Arduino compatible boards. In the end, the only thing that worked was programming the boards using a dedicated programmer (in my case an USBasp). Some digging around forums and Apple’s support site, the following steps has solved the issue on all the OS X machines where I have tried it. In short, you need to replace Apple’s drivers with the ones from FTDI. Voila – The Arduino IDE can now upload sketches to all boards I have tried, both with the old/legacy bootloader and Optiboot. After having problems with SD cards failing after a few months in a Raspi that was supposed to be always-on, it was time to look for options. The IPE distribution seemed like a perfect match – it effectively makes the Raspi only use a ramdisk, except possibly during boot. When needed the SD card file system can be made writeable, meaning that apt-get etc can be used as usual to install apps. This worked great for ca 3 weeks, then this setup ALSO failed, with the same symptoms as before: at boot only the red power light would come on – nothing else. A fresh SD card with a fresh copy of IPE worked fine in the same Raspi hardware, thus not the Raspi itself that had fried (the cabinet where it lives is kind of warm, nothing too crazy though). Now the weirdness starts for real. The failing SD card works perfectly fine when inserted in both an iMac and a Windows laptop. I spent hours and hours reformatting the card with various low-level tools, then writing the standard Raspian image to the card. Just for reference I did the same to a third SD card too, that card was identical to the failing one. Still the same issue: that one card would still prevent the Raspi from booting. The card in question is a Kingston 16 GB microSDHC card marked SDC4/16GB 081. It comes with an adapter that makes it usable also in large SD card connectors. Finally, and I of course should have thought of this sooner, I tried swapping the two different microSD to SD adaptors. And of course… the solution was simple. It was not the SD card that had failed, it was the adapter. For some reason (heat? just poor quality?) 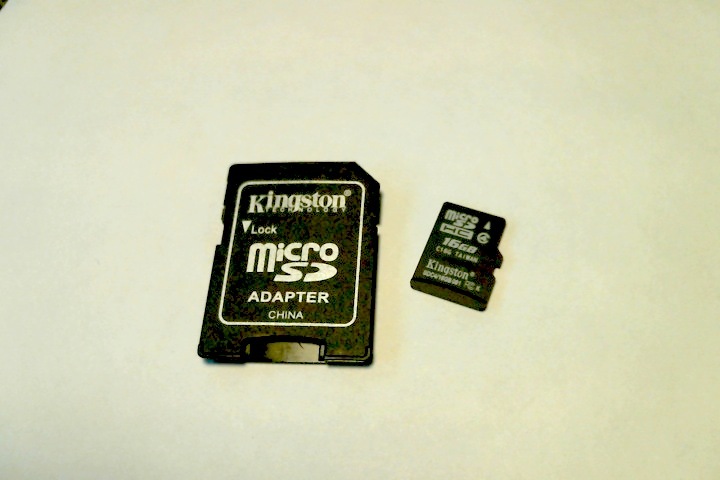 the adapter had a small crack in its plastic housing, and as a result most likely some poor connection inside, between the microSD card itself and the surrounding adapter. When inserted into a proper computer, there was probably enough pressure on the adapter to squeeze it against the actual microSD card, while the SD card holder on the Raspi is kind of flimsy, and did not provide the needed pressure. When using a working adapter all three microSD cards work flawlessly in the Raspi. Note to self: Use full sized SD cards in Rasperry Pis…. There is a new tool in the lab: An HP 6632A power supply. It might be a a bit dated, but it has some pretty good and useful specs (0-20 V, 5 A). True, modern supplies are more compact and offer more features in a smaller box, but a major advantage of an older supply like this, is that all schematics are available, they use large, easy-to-change components, and you have a decent chance of actually understanding how they work. A great thing about this particular model is that it can not only source current, but also act as a current sink. Useful when you need to see how other power supplies behave under load. The HP 6632A is programmable over GPIB (or HPIB – it’s more or less the same thing), but given the costs of GPIB adapters, I doubt I will get one.. Most functions of the supply can be controlled locally from the front panel anyway. A main exception is however the calibration, which requires a HPIB connection. Bummer… especially as this unit at first inspection seems to show slightly incorrect readings. Turning the supply on it worked a treat, but it is LOUD! Checking the schematics (available in the service manual) reveals that there is no intelligent fan control – it starts at full speed, and there it remains. No matter if the supply is loaded or not. Given my previous work on fan speed control, this is a challenge too good to pass on.. More on that later. So let’s take it apart. Ooohhhh… it is INSANELY dirty inside. That fan is just clogged with dust and I don’t know what.. That’s got to be bad for the bearings. Sure, Papst make great fans, but this one has taken a serious beating. And all the dirt inside the heat sink.. Nasty. Time to bring out the compressor and blow all the dirt away. The result is pretty good – almost all dirt was removed from the fan and heat sink, at least it is way, way better than before. The original Papst fan still sounds like a jet engine though, it is probably worth looking into a replacement. 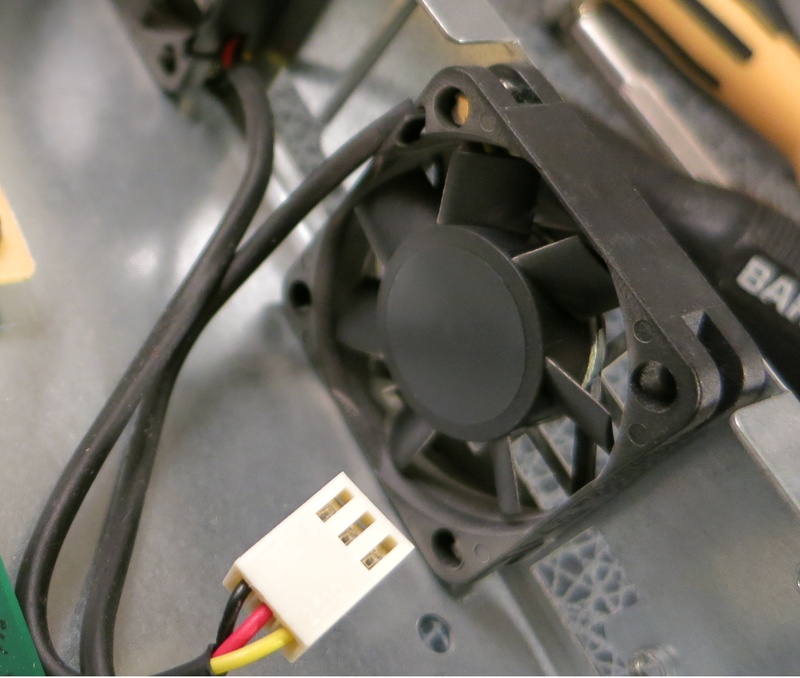 It is a 60x60x25 mm 12V fan, but the only 60×60 fans I had around here was a slimmer (ca 12 mm) variant. It is quieter, but does not provide as much airflow. Given that a) I will rarely load the supply heavily, and b) the supply has over-temperature protection built in, I am not too worried about replacing the fan. One small problem though: The screws for the old fan (they are screwed into threaded holes in the main heat sink) are too long. No suitable screws could be found, but wait – those springs that I scavenged from the first electronics kit I got when I was 10..? Hmmm… Worked a treat – almost better than the original! Next up: front output terminals. This is a factory fitted option (option 020) to the HP 6632A supply, but it is an easy thing to do yourself. The front panel is made of aluminium on the outside, with a plastic sheet on the inside. That plastic already has a cut-out for mounting output jacks, and there are solder tabs on the main PCB just beneath where the jacks go. Just drill a couple of holes in the aluminium and we’re good to go. But wait… it doesn’t work. The over-current protection kicks in as soon as I turn the supply on. Is it toast? No… silly mistake. The banana jacks I used were not the kind with insulated mounting. In a plastic box they would have worked nicely, but here.. they just created a short through the supply’s aluminum front panel. Duh. New, insulated jacks and all works fine. Make sure to use proper, heavy duty wires between the PCB and the jacks, in theory 5A at 20V could be flowing through there. I used the kind found in mains power centrals in residential housing, the copper is so thick it actually takes some effort to bend it. Should be plenty. Finally, regarding calibration. Setting the supply to 5V, the display shows 4.996 V. The 0.004 V error shown by the supply itself is 0.08 %, which is actually within spec compared to the 0.05% + 10 mV accuracy (i.e. 0.0125 V at 5 V programmed level) of the supply. A connected multimeter (Fluke 89 IV, known to be spot on with respect to multiple different precision voltage sources) shows 4.9957 V, so it appears at least the supply’s output voltage is actually within spec and calibration, after all. However, setting the output to 15 V, the supply shows 14.995 V, and the multimeter shows the same. So about the same offset as before. It might be within spec, but there does seem to be a ca 4-5 mV negative offset in the output. Not a problem in any way, this is not a precision power supply, and things will anyway change when loads are connected. And with that, the supply is in a much improved shape. It is still really heavy (not much to be done about that, I am afraid), the fan is a bit loud for continuous use, and no calibration without a GPIB adapter. Still some room for improvement thus! A while back I got an SSD drive with the question whether it could be repaired. At first glance it looked fine. But wait… the PCB is not level. In fact, it is seriously wobbly. What on earth happened to this SSD?? That PCB should really not have that shape. Looking closer at the flash ICs, it turns out several of them have pins that have disconnected from the PCB. Ok – that’s tough but nothing some careful soldering cannot fix. But after inspecting the rest of the PCB it is clear that some inductors and capacitors have been torn off too. Wow – this drive took a real beating – nothing here to be salvaged except maybe a crystal or inductor. Could possibly be useful in other projects. Well – it goes into the to-be-used-in-future-projects box. That’s only half the story… Quite a while back I came across another pair of PCBs. 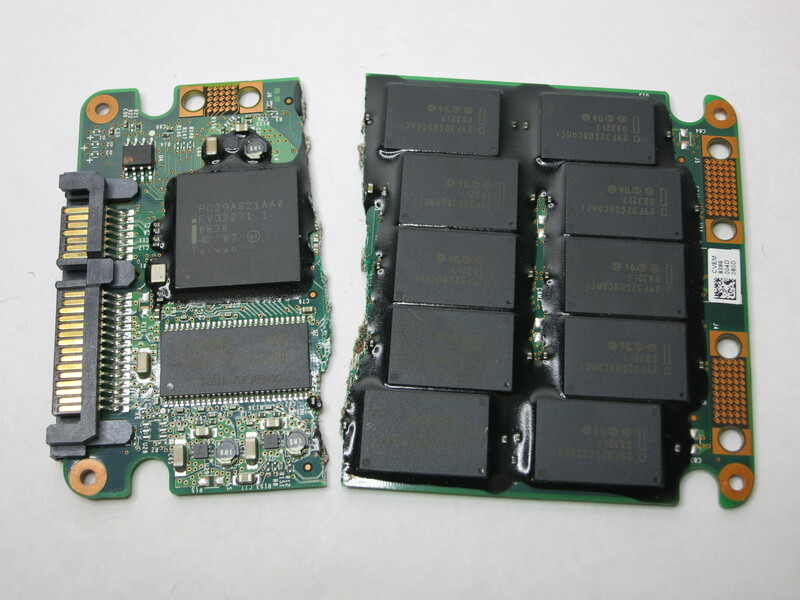 Another SSD, in fact – broken in two. Probably on purpose to prevent data extraction from the drive, but it gives a good opportunity to have a closer look at what is inside an Intel SSD drive. No rescue possible here, no matter how good soldering skills..
All the passive components (capacitors, resistors) are so small they are impossible to hand solder – no point in salvaging them. Most of the other components are held in place with epoxy, making removal impossible (but I will for sure buy Intel SSDs from now on – these things are built to last!). The PCB seems to have multiple layers. There is for sure at least a ground plane in there, probably 1-2 signal layers too (hard to count them without a microscope). 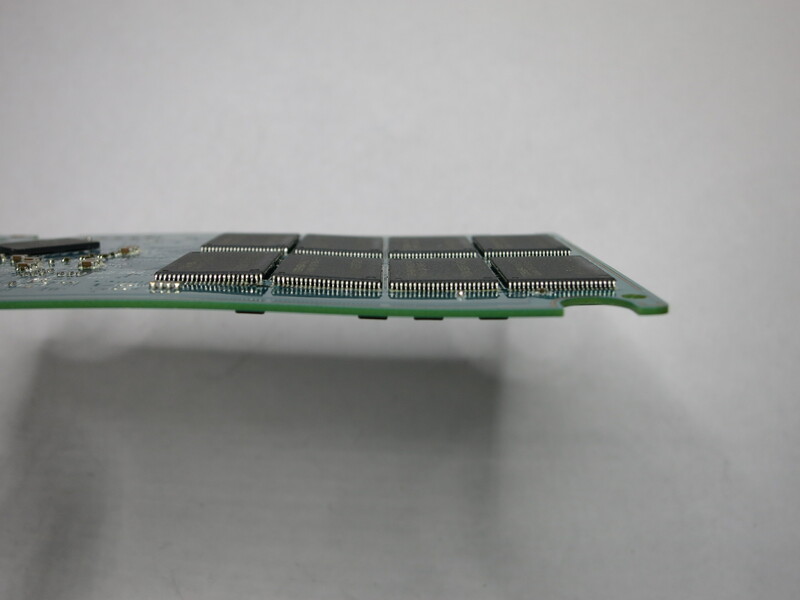 The one component that might be of interest in other projects (adding memory to OpenWRT based routers comes to mind) is the SDRAM, is a Samsung K4S281632I-UC60 8Mbyte x 16 IC. On the other hand – hand soldering that one will be… difficult (understatement) and require rebuilding the OpenWRT kernel. Hmm.. Will probably just recycle it. 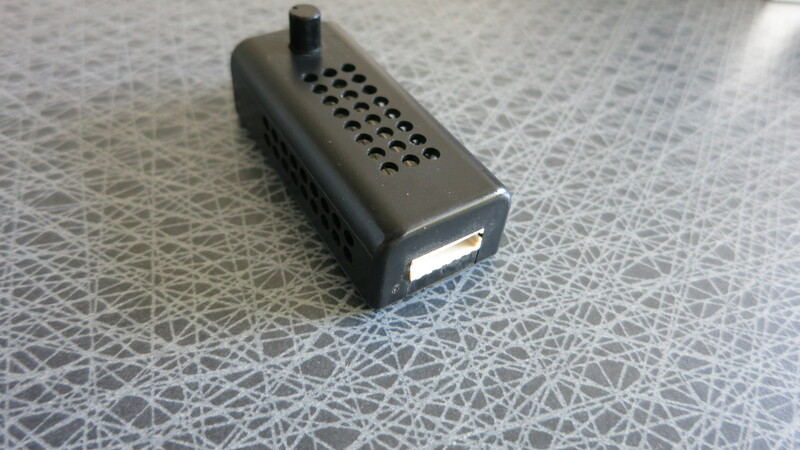 When buying some GP branded NiMH rechargeable batteries about a year ago, a “GP PowerBank Travel” charger (model GPPB03GS) was included as a promotion. It’s a nice little charger that runs both off 220 V and 12 V (for use in car, I presume). 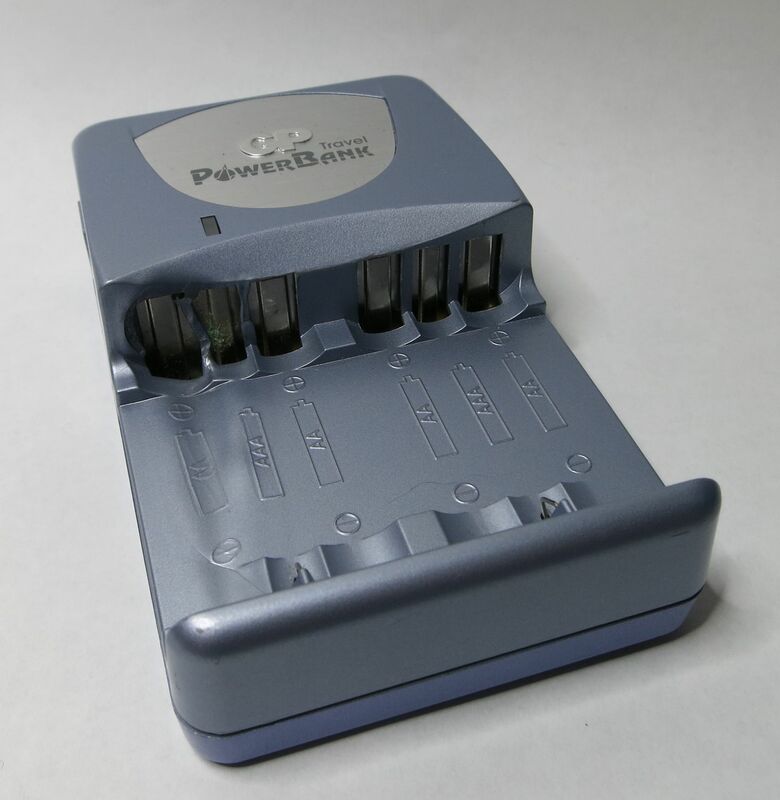 It can charge 1-4 AA batteries, or 1-2 AAA batteries, with additional trickle charging after full capacity has been reached. The charger worked well for some months, but one day after charging some batteries overnight the LED blinked red, and when removing the batteries it was clear something had gone wrong. See the melted plastic? Not good. 220V connection. No grounding pin. – 220V section, which is shielded with plastic blast shields towards rest of the electronics – nice! This is a classic Switched Mode Power Supply (=SMPS), with an optocoupler feedback loop. Looks like a SMD type TL431 voltage reference – very common in SMPS designs. – 12V section, with some protection diodes, filter caps etc – but no other major components. – Charger circuit, using an unknown controller IC. The markings have been shaved off. I just don’t understand why they go through the trouble of doing that… It’s not like this is some super classified product where the design should be kept secret at any cost. A closer look at the components and PCB around where the plastic had melted does not give any clues of what has gone wrong – in fact nothing visible anywhere on the PCB indicates a catastrophic failure of the charger. 220V section with rectifier bridge, and just above it the underside of the optocoupler. 12V section at top left, 220V section at top right. Notice the physical separations in the PCB between 220V section and rest of board. Bringing out the multimeter and measuring the output from both SMPS and 12V section shows that those voltages are all good – most likely the problem is instead in the unknown charging controller IC, or possibly some of the tiny SMD FETs, diodes etc that complement the charging IC. So… given that this kind of charger cost next to nothing these days, I’ll leave it for dead for now. The SMPS works as it should, so maybe that part can be reused in some other project – I’ll stash it in the “possible-future-use” parts bin. After using the same ERSA MS 6000 soldering station for the past 20 (!) years or so, it was time to upgrade. Nothing wrong with the old one really, except that it was hard to get new tips and that heating it up took a minute or two. Getting a Chinese rip-off from eBay would be easy, but if the next soldering station would also last 20 years, why not get something slightly better? JBC has a good reputation and seemed to have good value for money. So – here are some pics from the unboxing. Enjoy! Notice how the box is folded to provide an integrated carrying handle? Kind of cheap manual, turned out to be nothing about setting up the station. Hmmm.. On the other hand – it wasn’t needed – super easy. Except for the actual station, this is all there was in the box. No CD for the software, but that’s actually good. Rather reduce the carbon footprint and download the software instead. The handpiece has a velcro strap holding it together. Would only be used during transportation – nice nonetheless. Handpiece connector with locking mechanism. 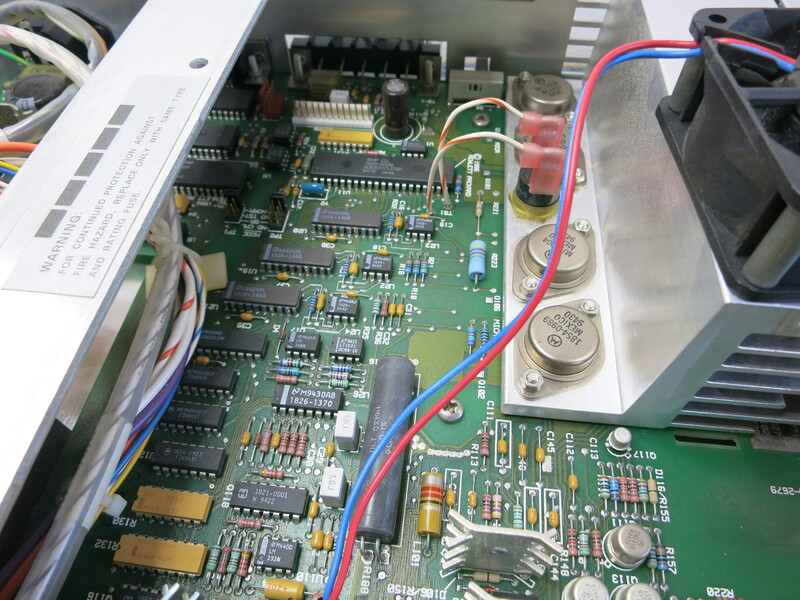 This was missing on the old ERSA 6000 – lot’s of bad connections on that one.. If no tip is inserted the station detects this and tells you. After inserting a tip it heats to 350 degree Celcius within a few seconds. AWESOME!! Placing the handpiece into the holder puts the station into sleep mode, lowering tip temperature. Increasing the temp then takes just a couple of seconds. Changing tips can be done using the integrated tip extractor. Not sure it will work… But the station does detect that you have placed the tip in the extractor, and lowers temperature in response. Nice. 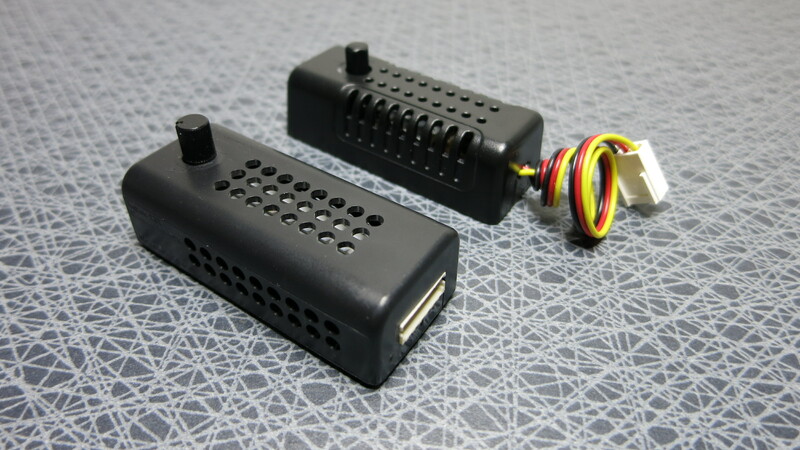 The eBay controller only has one 3-pin male connector (where the fan connects), and then a soldered in wire with a 3-pin female connector, for attaching to the PC or other equipment. The Zalman on the other hand has a 6-pin male connector on one end, a special Y-cable (it comes with the Fan Mate 2) is then needed to hook up the controller to fan and PC. Both variants of course work, the Zalman approach is maybe slightly better, as it allows the controller to be mounted closer to an inside corner, without the cables being in the way. Not a major difference though. Looking inside the eBay controller, it is obviously different from the Zalman. For starters, it has a NEC B772 P PNP medium effect transistor in there, rather than a voltage regulator. I could not find a datasheet for that particular NEC device, but I am pretty sure it is more or less identical to ST’s 2SB772. Tiny heat sink in there, will it really dissipate 12W of heat?? There is also a TL431 adjustable voltage regulator in there, together with a second SOT23 transistor market J6, it might be a S9014 NPN transistor (or equivalent). So, in essence the eBay controller is also a linear regulator, but based off an adjustable regulator (rather than the fixed-voltage 7805 that the Zalman uses), with an extra power transistor to boost current. The extra transistor is needed, as the TL431 can only sink 100 mA on its own. All good so far. But when reverse engineering the eBay controller, the schematic just doesn’t add up. Below is what the eBay controller looks like, with the above assumptions on components – and this is not a working circuit, as far as I can tell (or is it? Feel free to add your expertise in the comments!). 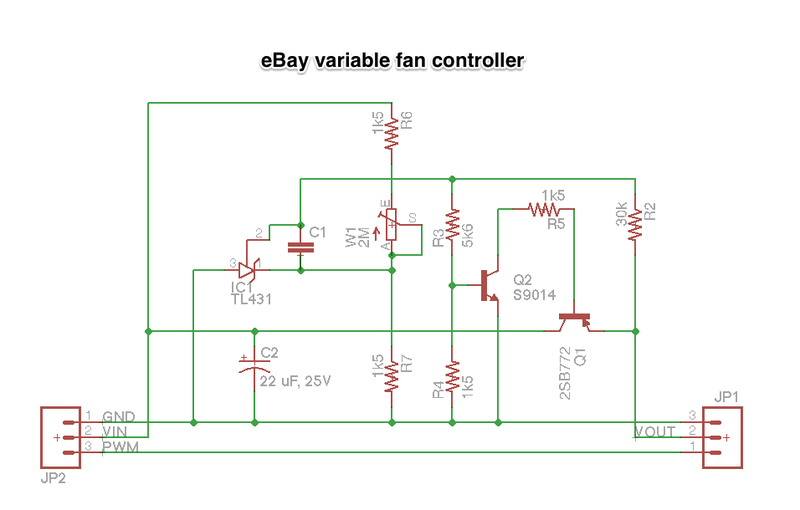 eBay variable fan controller – except that the circuit is a bit weird.. Need to re-check those PCB traces! So…. either I made incorrect assumptions regarding what SMD components are used in the eBay controller, or I just didn’t check closely enough how the PCB traces were connected. Time to bring out the multimeter to check those traces – more to come on this topic. During the recent work on the one dollar variable fan controller, I looked into options for documenting the work. I have never really used CadSoft Eagle enough to get comfortable with it, and whenever I used it it seemed to be overkill for what I wanted to do. Still, it is usually still seen as the best software for this kind of work. But maybe there are other options.. In particular I thought the more basic editors sounded promising – let’s give them a try. Disclaimer: Nothing near a full review was made of the different services. The verdicts below are instead based on 15-20 minutes use of each service, and no reading of any manuals or help pages. This would be the new kid on the block. Mix schematic editor with GitHub and you get something like Circuits.io. You can follow circuits created by other people, fork your own variants of other people’s circuits etc. Very nice concept, but it also seemed to have a lot of limitations..
For example, I failed mirroring the 7805 in the circuit to the right. Having the output to the left feels very awkward.. I am sure there are ways around it, but even though I really searched for it, I also failed to find a traditional 7805 symbol such as the one in the second image, and was left with the one used in the top schematic. Fail. There for sure are nice things about circuits.io though. Having an entirely browser based editor is a very nice concept. It might be too early days for it now, but good things come to those who wait… I also liked the feature where you, given a PCB board design, can get files for 3D printing or milling a custom case for your board. Nice! The fan controller project can be found at http://www.circuits.io/circuits/4841. Go fork it! This is also a pretty new project, with a lot of promise. It is obviously geared towards hobbyists that might not have a ton of experience in electronics design, but it is still kind of nice. With a slogan of “from prototype to product” it is clear that the Fritzing team is trying to cover it all. Not sure I would want to go this route with a full project though – I always get suspicious about software that offer a link to some third party service (in this case for manufacturing of PCBs). 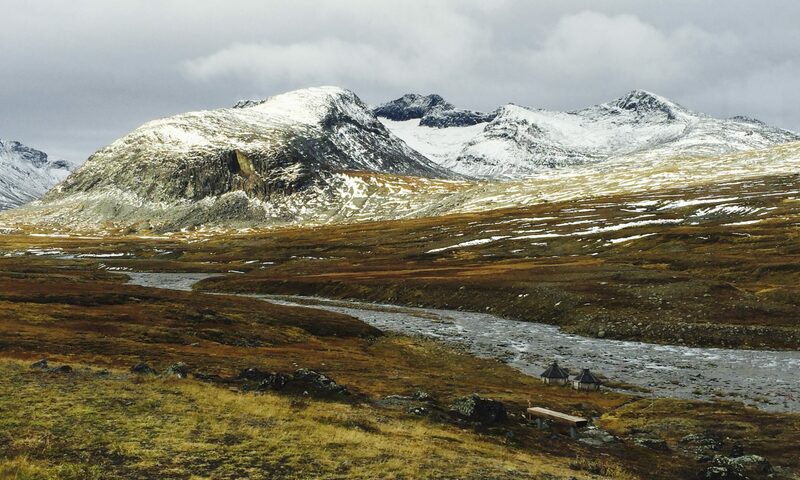 It probably works perfectly fine – I just feel left without the control I want to have. The schematics editor is nice (better than circuits.io), and I even like the slightly silly feature where you can get a breadboard view of the circuit. Probably not a bit useful for an experienced electronics hacker, but still kind of cute. CadSoft Eagle is a professional schematics editor and PCB layout tool. The free version does have some limitations (PCB size and # layers, among others), but they are pretty generous and won’t cause any problems for most hobbyist projects. The UI feels a bit dated, to be honest. But also quite efficient, given the vast number of components available. Seems lots of people also create their own Eagle libraries with various components, so there is a good chance you can find, download, install and use existing libraries. Otherwise it’s not too hard to create your own, half an hour of fiddling around with libraries left me with a working one. Nice! Of the three tools Eagle is by far the best, even when considering the somewhat steep learning curve. Give it an hour and you will be able to create fairly complex circuits. PCB layout is still a bit of an art, no matter what product you use – you just have to learn as you go along, and from mistakes. Eagle does have some nice tools for eliminating the most obvious errors though – once again, nice. All in all, going forward Eagle will (still) be the preferred solution around here. While trying out various computer and network gear, I quite often find the fans too loud. They are of course there for a good reason, but experience tells that the device usually works just fine with less cooling. Best case one or more fans can be removed altogether, even though that is typically not recommended. They are of course put there for a good reason.. Anyway, I have repeatedly found myself looking for an easy solution to control the speed of regular 12V fans. Something that is just plug-and-play. Ideally also cheap or even free. 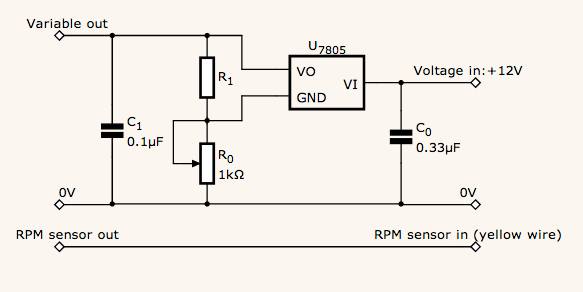 Going through a 7805 data sheet for other reasons, I suddenly realised that a 7805 set up in variable voltage configuration (figure 4 in the data sheet) should work great as a fan controller. 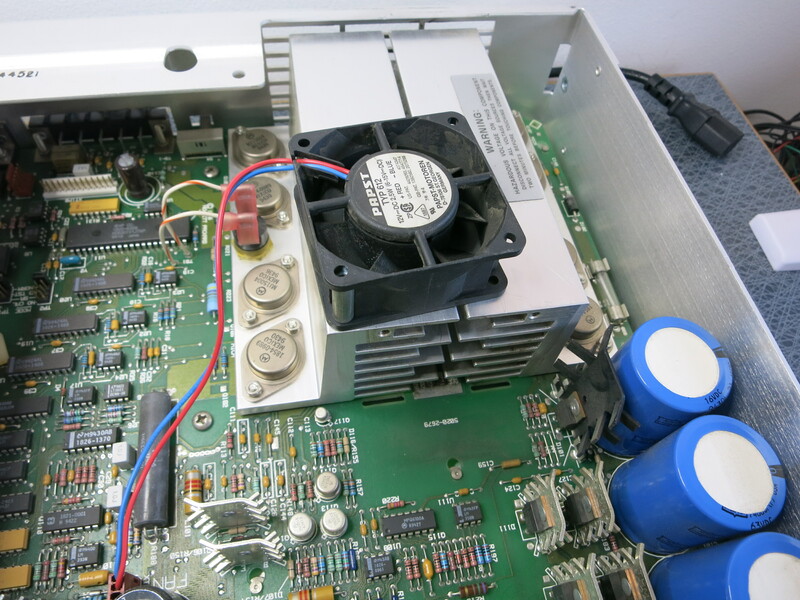 These 12V fans usually run just fine down to 5-6 volts, but at lower rpms, and thus quieter. Just what was needed! The circuit is pretty clever – by shifting the ground to a higher level than the common ground/0V level, we get the voltage regulator to output between ca 6V and 10.5V. The component values were ones I had in my junk box, making a point of only using scavenged parts (don’t forget a heat sink for the 7805!) plus a little piece of strip board, the cost for me was actually zero. Nice! A possible drawback of the design is the fact that a linear regulator like the 7805 will get rid of all (well… most anyway) excess energy as heat. A proper heat sink is thus definitely needed. An option would be to use some kind of low drop-out voltage controller (to get the upper limit closer to 12V), but it would have the same issue with heat dissipation. A better/easiesr option is probably to use one of the many PWM fan controller ICs available (here is Maxim’s list, there are plenty others too), it deals with at least some of the heat waste issues. You might be able to get some free samples too if you just want to play around with them. Most of them are not too expensive though. All working well thus, and the story could have ended there.. However, a week or two later i was pulling apart an old PC when I found a couple of Zalman Fanmate 2 controllers… Too much of a coincidence not to see what made them tick. After pulling one apart it turns out it is using exactly the same circuit as above! They did go a bit cheap and skipped the smoothing caps though, seems to work fine anyway – the fans won’t care much about some noise on their power line. Also, the heat sink seems quite small and the controller is only specced to 6W, which is half of what the 7805 should be able to handle (it can handle 1A, so 1A*12V = 12W max power, with a proper heat sink). Interestingly enough the Zalman controller costs ca USD 7 – not a huge amount of money, but one dollar to buy the components of your own (or even zero!) is a lot better..
“Quality control” passed – yeah right.. The lower and upper parts of the box is held together by pegs/holes in each corner. No screws. I recently got the chance to evaluate the Anaren AIR CC2530 BoosterPack Kit, which is a ZigBee eval platform for TI’s LaunchPad products, i.e MSP430 and Stellaris. Kudos to the good folks at element14 for providing the kit as part of their RoadTest program. The review is found at element14’s site, but also here for completeness. I will also post further developments using the kit here on the blog, as described in the review I have some ideas around a cat-detector… So many projects, so little time.